Delight family and friends with these tasty cookies that have a sweet red or green cherry surprise in the middle! Drain maraschino cherries thoroughly on paper towels; set aside. 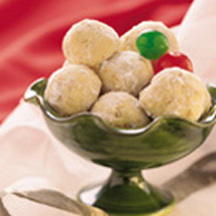 Put butter and 1/3 cup confectioners' sugar in a large mixing bowl. Beat with an electric mixer on medium speed 3 to 4 minutes, or until well mixed. Stir in almond extract. Add flour and salt; mix well. Stir in pecans. Shape about 2 teaspoons dough around each cherry. Place on an ungreased cookie sheet about 1 inch apart. Bake in a preheated 375°F (190°C) oven 12 to 15 minutes, or until set but not brown. Roll in confectioners' sugar while still warm. Let cool. If desired, roll in confectioners' sugar again. Recipe provided courtesy of the Cherry Marketing Institute.